Where is my Visa or MasterCard verification code? Where is my American Express verification code? 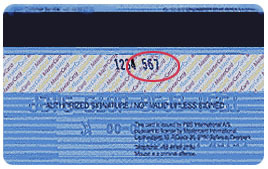 This number is printed on your MasterCard or Visa cards in the signature area of the back of the card. (it is the last 3 digits in the signature area of the card). You can find your four-digit card verification number on the front of your American Express credit card above the credit card number on either the right or the left side of your credit card. THE CARD VERIFICATION VALUE CODE: is an authentication procedure established by credit card companies to reduce fraud for internet transactions. It requires a card holder to enter the code at the time of an online transaction to verify that the card is on hand. The credit card information that you will be submitting is protected by Secure Socket Layer (SSL) technology certified by a digital certificate.